TEDx Speaker Dan Ariely (The honest truth about dishonesty) Talks Honestly about Dishonesty. Ariely’s research indicates that dishonesty is an inescapable part of human nature. But as he showed in two previous studies, The Upside of Irrationality and PREDICTABLY IRRATIONAL, such behavior has its reasons. His fascinating look at what motivates lying and cheating also illuminates what compels us to be truthful. Dan Ariely reads from Predictably Irrational: The Hidden Forces That Shape Our Decisions. Dan Ariely , Predictably Irrational: The Hidden Forces That Shape Our Decisions. What's behind your actions&quest; Find out when Prof. Dan Ariely visit with his new PREDICTABLY IRRATIONAL: THE HIDDEN FORCES THAT SHAPE OUR DECISIONS. This is an engaging and insightful examination of human behavior by a Professor of Behavioral Economics at MIT and visiting professor at Duke. Dan Ariely is currently considered a "single author." If one or more works are by a distinct, homonymous authors, go ahead and split the author. 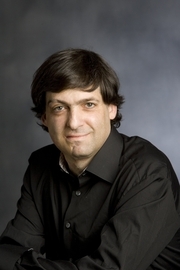 Dan Ariely is composed of 8 names. You can examine and separate out names.